âWe (Chamber Members/business people) accept that it is an ongoing project and we need to get ready. We donât know when it will be completed, but we cannot wait for planes to start landing before we are ready to do business; we need to be ready,â said DaSilva on Wednesday, during a visit to the Argyle international airport site. DaSilva and a number of SVGCIC members went on an official tour of the site on Wednesday. The tour was conducted by chief executive officer of the International Airport Development Company (IADC) Dr Rudy Matthias and the IADCâs communications officer Jennifer Richardson. During the tour, which began at the construction site of the airportâs control tower, DaSilva said that she is very impressed by what she has seen. A member of the tour party enquired about the availability of shops inside the terminal building when the airport is fully functional and Matthias said that the process of choosing shop operators would be put out to tender. She said that the SVGCIC is very much interested in having an input in this aspect of the development, as it can have positive impacts both for the Chamber and its members. She said that apart from the possibility of members getting shops inside the terminal building, the fact that the airport would bring tourists to the country is also a plus. âWe would also like to meet with the Tourism Authority because they have the job of attracting people here and that is an area where we need to see their strategy to see how we can get involved,â said DaSilva. He said that the Chamber decided that it would be a good idea to invite its members to have a firsthand view of the airport development during an official tour. 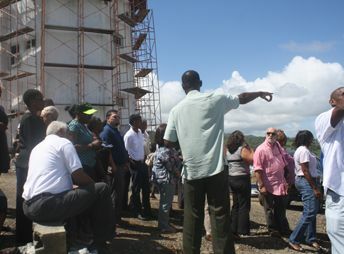 âThis is where the people who know what exactly is going on are able to assure us about the way things are going and where we can ask questions and have members gain intimate knowledge of the airport and its construction and also get a feel of its readiness what the challenges are, what is completed and what is to be done,â said Regisford. He, like DaSilva, also addressed the possibility of Chamber members operating businesses inside the terminal building. Regisford said that he was thankful to Matthias and Richardson for taking them on the tour. The tour took persons from the prefabricated control tower, to the area where the river is being spanned, to the terminal building, while persons also viewed the runway.